Pedini PDX is located in the lively and ever-changing Pearl District neighborhood. We are your solution for a modern, modular kitchen and bath cabinet system. Our European kitchen cabinetry has been tested world-wide and is known for innovative ideas and production techniques. 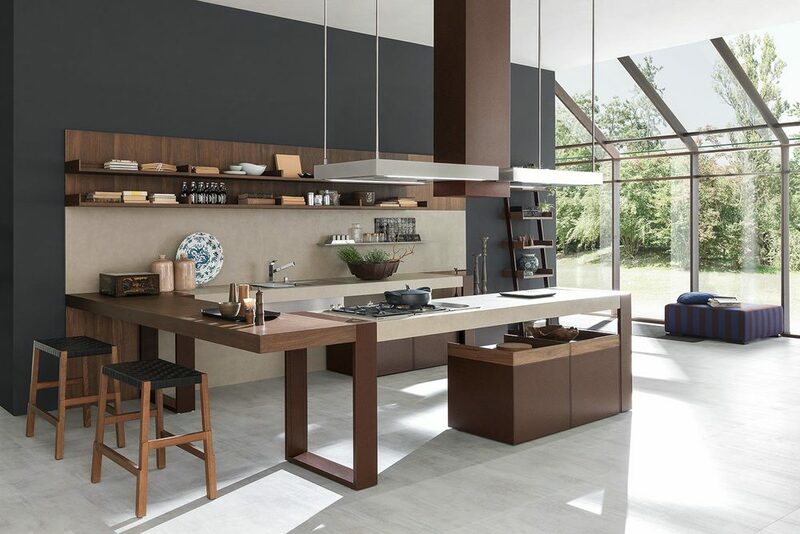 When you purchase a Pedini kitchen, you are receiving a full package — unparalleled Italian luxury; state-of-the-art custom design, built around ergonomics and functionality; a modern and sustainable aesthetic which never goes out of style; and our local and knowledgeable white-glove service — ensuring long-term satisfaction in your investment. We would love to meet you. Stop by our Portland modern kitchens and bath showroom, call (971.254.9856), or email us to try out the Pedini difference for yourself. This penthouse in the Pearl District of Portland, Oregon features Pedini Italian cabinetry throughout, in layouts that take full advantage of the stunning views! The philosophy behind Pedini’s newest cabinet line is to innovatively recreate the past design style of Arts and Crafts. It is a nod to the past while incorporating current technological elements. 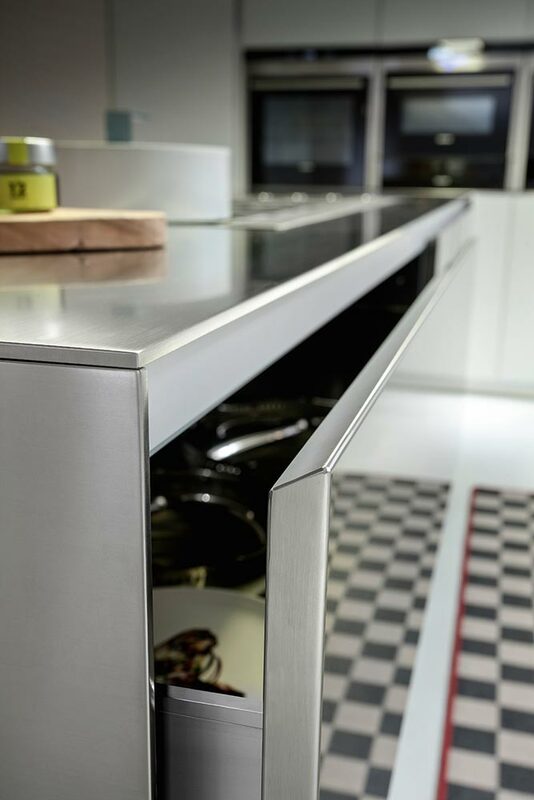 Throughout the cabinet line you will see finishes such as solid wood, cement resins, pewter, and corten steel. The layouts are a more “broken up” style which makes the kitchen components feel more like furniture that blends in with the rest of the space. These cabinets are still highly customizable allowing multiple layout possibilities. Interesting details and exquisite craftsmanship are combined to achieve this beautiful new cabinet line by Pedini. 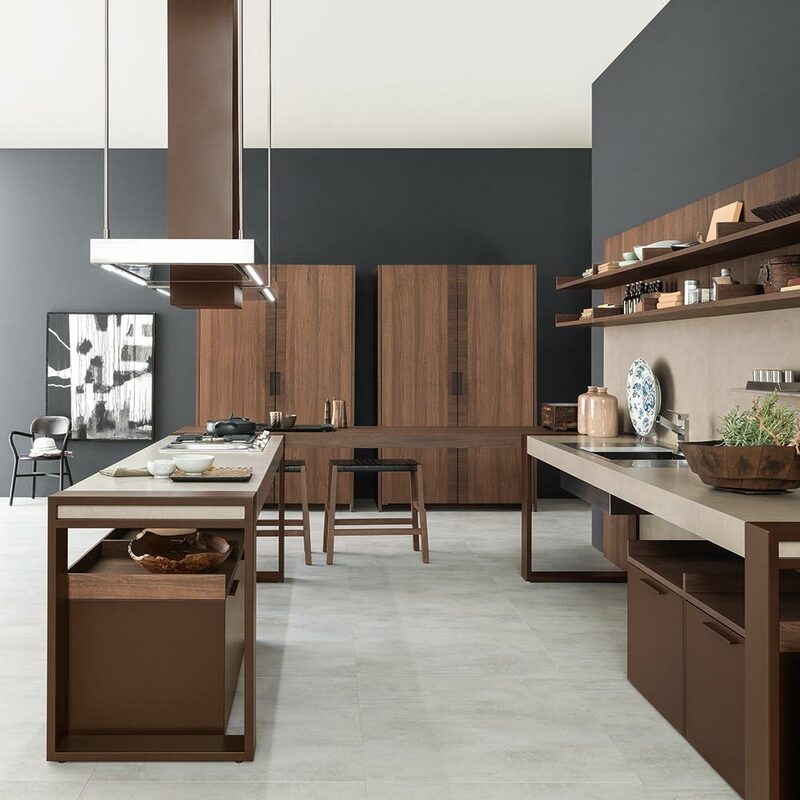 The cabinets are offered in multiple finishes such as matte and glossy lacquer, a variety of natural wood veneers, stainless steel, glass and Ecomalta. All finishes are extremely durable and free from any off-gassing materials. The 30-degree miter on the door edges makes for a unique and modern aesthetic. Pam and I wanted to thank you and Pedini for your efforts on our behalf during the recent kitchen remodel. We are very pleased with both the final outcome and the process to get there. Your design skills improved upon our basic ideas and helped us select finishes that we love. You were extremely efficient and responsive from beginning to end, patiently answering both our good questions and our bad ones (I asked more than a few of the latter!). You and Pedini stood by your quotes and promptly resolved the usual issues that arise during a remodel; e.g. a door was damaged and in less than a day you had arranged for a replacement to be sent and installed at no additional expense.